This long, strenuous hike is a waterfall extravaganza not only because of the unique and stunning waterfalls, but for all of the amazing cascades in between. The trail begins on a gravel road to Soda Springs (see Soda Springs in 0-5 Miles) through a mix of forest and meadows. 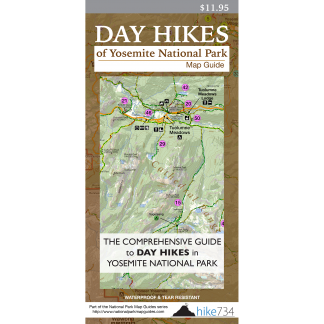 The trail continues along the winding river and lovely Tuolumne Meadows before following the river into the canyon. You’ll pass endless cascades including Tuolumne Falls and White Cascade down to the Glen Aulin High Sierra Camp (see Glen Aulin). You leave the camp to another great cascade over orange granite to a long, slow section of the Tuolumne River. While a few cascades along the way may fool you, California Falls is a long 120ft/40m cascade. It’s also your first view of a “waterwheel”. A waterwheel is formed when the underlying granite kicks the water high up in the air forming a feature resembling a wheel. The trail drops down to the base of the falls before continuing along the river. The river alternates through a series of wonderful cascades briefly interrupted by slower sections of the river. 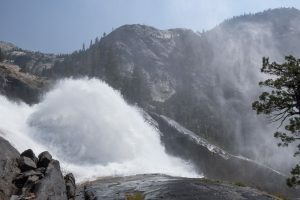 Le Conte Falls is a towering 250ft/80m falls over steep granite with several large waterwheels. The trail continues dropping into the Grand Canyon of the Tuolumne River with ample views of the canyon and cascading river. Rising spray from the huge waterwheel on Waterwheel Falls alerts you to your arrival at this water feature. The best view of the waterwheel is from above by walking a short way down the sloping granite. From there you can see the huge waterwheel flinging water into a rift in the rock as the river makes an abrupt right before continuing on as a series of cascades. Trailhead: Park at the signed Lembert Dome Picnic Area located at the east end of Tuolumne Meadows. The trail begins on the gated, gravel road that continues west.